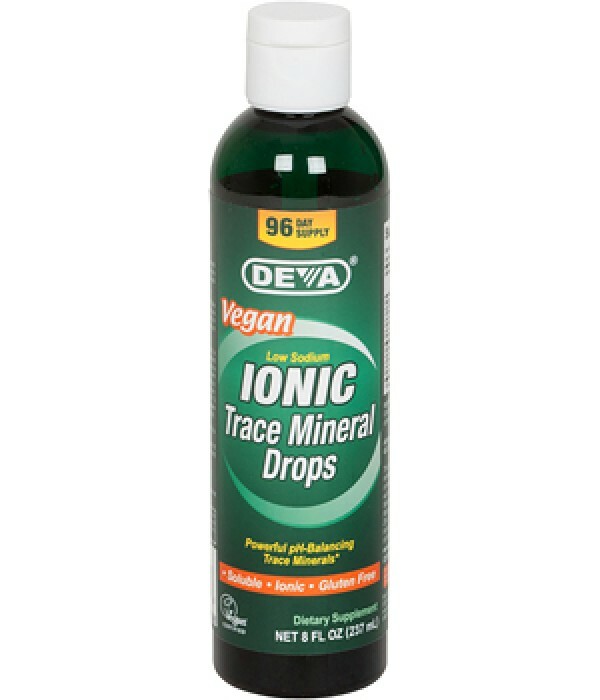 DEVA Vegan Trace Minerals is a mineral concentrate that contains over 72 naturally occurring ionic trace minerals from Utah's Inland Sea. 99% of the sodium is removed making it a "low-sodium" supplement. Our reasonably priced product can be a great addition to your supplement regimen if you are looking for a high quality trace mineral source. The sodium in the inland sea of Utah is removed by using a solar evaporation technology without the use of chemicals or dyes. This solar concentration method allows us to offer you this great trace mineral product without added ingredients. 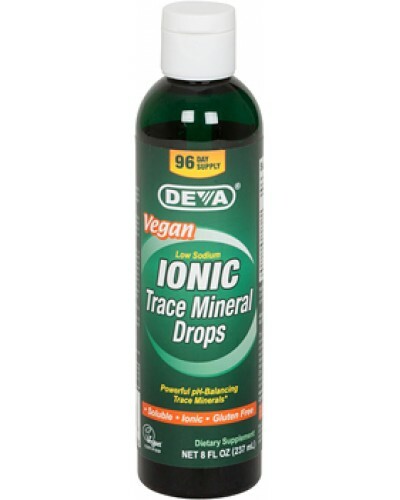 DEVA Trace Minerals is 100% vegan, vegetarian and is registered by the Vegan Society, the non-profit organization that actually invented the word "vegan". Ingredients: Ionic sea minerals from the Inland Sea of Utah, USA. Contains no other added ingredients. This mineral product is highly concentrated, contains no added preservatives, flavors, or sweeteners and has a very strong taste. We recommend mixing it with juice or food and dividing the serving throughout the day to mask the concentrated mineral flavor. Begin regimen by taking 10 drops for 3 consecutive days. Each day thereafter, increase serving by 10 drops up to 1/2 teaspoon (40 drops) once daily. Children over age 2: Take 1 drop for every 5 lbs of body weight. Re-mineralize Water: To improve the flavor of distilled, reverse osmosis or purified water add 20 - 40 drops per gallon. Free of yeast, soy, wheat, gluten, milk, sugar, salt, starch, preservatives; animal products, byproducts or derivatives. Antimony, Barium, Beryllium, Bismuth, Boron, Cadmium, Calcium, Carbonate, Cerium, Cesium, Chloride, Chromium, Cobalt, Copper, Dysprosium, Erbium, Europium, Gadolinium, Gallium, Germanium, Gold, Hafnium, Holmium, Indium, Iodine, Iridium, Iron, Lanthanum, Lithium, Lutetium, Magnesium, Manganese, Molybdenum, Neodymium, Nickel, Niobium, Osmium, Palladium, Phosphorus, Platinum, Potassium, Praseodymium, Rhenium, Rhodium, Rubidium, Ruthenium, Samarium, Scandium, Selenium, Silicon, Silver, Sodium, Strontium, Sulfate/Sulfur, Tantalum, Tellurium, Terbium ,Thallium, Thorium, Thulium, Tin, Titanium, Tungsten, Vanadium, Ytterbium, Yttrium, Zinc, Zirconium, plus other naturally occurring trace minerals found in Great Salt Lake, Utah.